Looking for a great way to package your holiday treats? Why not decorate your own?! Many times in the past I've gone out and bought cheap decorative containers for holiday treats-- and you know what the main problem was? I couldn't get the darn thing to stay closed! And you know what that means? Stale cookies before they even get delivered! So when I was given the opportunity to decorate some of my favorite Rubbermaid containers for my holiday baking you know I was psyched! Great quality containers (that close and stay closed) that you can personalize any way you like with a Sharpie® marker! You can see one of my containers to the left. I like that you can make them as simple as you want & still have that personalized feel. You can even add your cookie recipe to the top of the container! TakeAlongs are available Wal-Mart, Target, K-Mart, grocery stores, drug stores and clubs. Fine Point colors let you click away with the color of your choice. Verdict: I love Rubbermaid containers and I'm having a great time personalizing my holiday treats with the Sharpies! 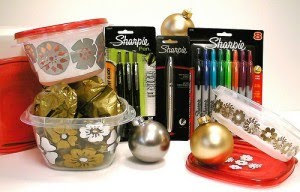 Win it: One lucky Frugal & Fabulous reader will win a Rubbermaid & Sharpie holiday prize pack including: a 15 piece Rubbermaid TakeAlong set, a Sharpie Retractable Marker Set some Sharpie Pen Retractables and a Sharpie Stainless Steel Permanent Marker! *Tell me what treats you are baking/making this holiday season! You have until Monday, December 20@ 7pm EST to enter! (Winner must respond within 48 hours.) Giveaway open to U.S. residents only. Disclaimer: I was provided with a prouduct in order to write this review. All opinions are my own. I am making red velvet cake balls this Christmas. I love these containers for sharing. Thanks! I love the rubbermaid storage totes for winter decorations. Thanks! I subscribe to your blog through Google Reader. Thanks! I'm making peanut butter reindeer cookies for a cookie swap on Sunday! Love the Sharpie metallic pens! I love the Easy find lid containers from Rubbermaid. I like the Sharpie calligraphic markers that I use on my cards all the time. I love the Sharpie Pens. I am making spritz cookies and they will fit perfectly in the rubbermaid containers! My favorite items are the rubbermaid containers and the sharpie metallic pens - perfect combination. I will be making some chocolate Peanut Butter Balls and Peppermint Bark. Love the Reveal Spray Mop from Rubbermaid. Love the Fine Point Permanent Maker from Sharpie. I love food storage containers and those produce saver ones look wonderful. Finally I'll be able keep things crisper but let it get some air and not wilt. I also make cookies for the Holidays. Coconut macaroons and I'm not sure which other types this year. Fav item from Rubbermaid: Premier food storage container! Already subscribed to your emails! thanks for sharing and happy holidays to all. I love the limited edition 80's retro color sharpies!! I'm making black bean brownies. Yes you read that correctly Google it they actually quite tasty. I'm making gingerbread cookies, fudge and Oreo truffles. I'm not doing any baking this year, but I will be making a huge pot of sauce for our stuffed shell. My favorite Rubbermaid items are the Produce Savers. I'm making cake balls and these chocolate "spider" candies! I really like the keychain sharpies! I am making brownie covered oreos this year! I love the Rubbermaid Easy-Find lids products. My favorite are the retractable sharpies. So neat.